I have been walking through a kind of fog for the last forty-eight hours, and maybe you have been too. I didn’t even go to the game, I watched it on stream! From the high midfield angle of the main camera, it looked like any professional soccer match I’ve watched. But the energy coming from the crowd was incredible. More importantly it was pulling in the same direction that I was pulling. I am so used to watching the great crowds across the league go silent when Minnesota score and cheer when the Loons get scored upon. That energy is infectious, it feeds on itself and builds. It’ll probably be even weirder when I am able to visit in person, but it is still difficult to come to terms with the fact that this place now exists in Minnesota. Not just anywhere, but steps from where I used to live, partially on the site where I used to buy groceries. Even before I lived nearby, over two decades of nothing and then suddenly, boom, a beautiful stadium that your favorite team plays in, and all sorts of dignitaries showing up to that place to watch. How do you even explain that? Anyway, it looked and sounded superb. The tifo was incredible and hit exactly the right tone. I loved the roar from the crowd as the final banner was raised that showed the entire stadium was watching. It’s incredible to me how so many people have fully embraced these weird and unusual elements of soccer culture, and I love thinking about how many people witnessed the spectacle for the first time, and the impression it must have made. The transportation side of things seemed to also go well. As I wrote earlier in the week, there were going to be some hiccups, but that concerns about traffic and parking were manageable. I hope that everyone can learn from this experience. 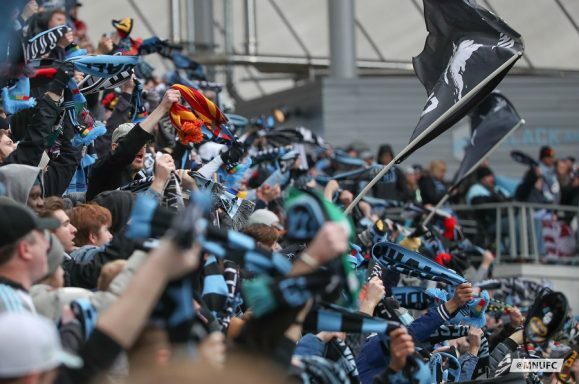 There are vanishingly few people who will say “I’d love to go to the Minnesota United game, but I won’t because there isn’t convenient parking.” If you’ve got something that people want to go to, they’ll find a way to get there. Anyway, there’s enough to say about the stadium to fill several columns, but it’s also a true that a real soccer game was played on Saturday. The Loons drew against New York City 3-3, with Ozzie Alonso scoring the opener and Sean Johnson scoring an own goal for the ages. There was also a VAR review to call off a goal, a VAR review to call off a penalty, a bad-looking head injury, and some handbags. It really had everything, good and bad. 5. The lack of back pressure was a killer. Like many teams, Minnesota plays with two lines of four and two forwards in defense. The two lines try to gum up the center of the field, cut off passes in between the lines, and eventually clear or gain possession of the ball. Ahead of those two lines are two strikers. Their job is to be an outlet in transition, but it’s also to play defense. When the ball is ahead of them, they press, and when the ball is behind them, they put pressure on the ball from behind. It was this latter responsibility that was completely missing from United’s game on Saturday. Both forwards pressed the ball ahead of them, but once they were bypassed, they stopped putting in any effort, and the entire Loons defense retreated deep into their own third. The results were… not good! The Pigeons were allowed to keep possession and loiter on the ball in the attacking end. The time and space they were allowed was simply unbelievable, and it caused plenty of concern. Meanwhile, when Minnesota gained possession, they were often so deep in their own zone that the possibility of a counterattack was too remote (and more so without a speedy forward). I just cannot understand what the plan was in defense. I have almost never seen a team get so much easy, unchallenged possession so deep in the attacking end as New York City did. The Loons just let them have it. Not every team has to be a counterpressing team, but there’s just no justification for how passively Minnesota’s two forwards played, and I thought it was terrible for the team on both sides of the ball. 4. Ángelo Rodríguez touched the ball too often, Darwin Quintero touched it too little. Speaking of the two forwards, despite the three goals scored, you’ve still got to be a bit concerned about this attack. In their six games, the Loons have been credited with fourteen goals scored. But three of them were penalties that were far away from any danger and two of them were woeful own goals. The topline stats belie a team that has gotten quite a bit of luck. The last couple games I have been griping about the team’s reliance on playing through Ángelo Rodríguez’s hold-up play, and I’m going to do it again. He had sixteen touches in the match besides his goal. Meanwhile, Darwin Quintero had twenty touches apart from a corner. 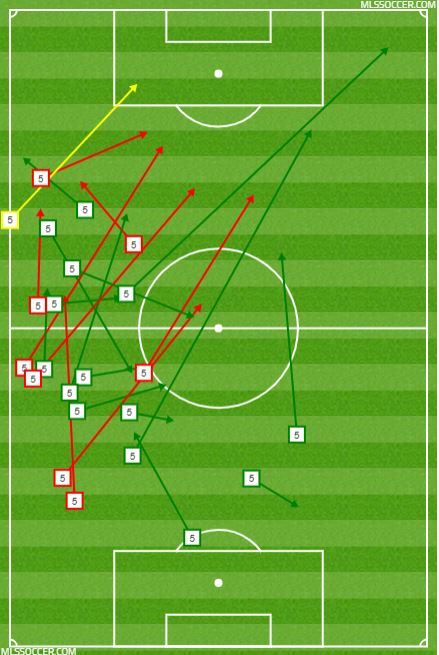 When the big Colombian has almost as many touches as the little Colombian, things are not properly aligned for the Minnesota attack. I don’t think that should be happening. United need Quintero to get on the ball and work to build up the attack. If he can get space to run into, the better. Meanwhile, they need Rodríguez to either knock the ball down and get out of there, or to just plain get out of there. Either way, if he is too involved in the play, it takes up space better occupied by Quintero, slows down the attack, and leaves the Loons without a target up front. Yet again, Rodríguez had a fairly poor game—except for each of the goals. He used his body to create havoc on the first, scored the second, and pressured Johnson on the third. The Loons will certainly take that impact, but they could have more of it if Rodríguez was in position to create it more often. They have to get Quintero in the engine room and Rodríguez out of it. space for the second. He seems to always be ahead of the play on the attack, or in front of the ball on defense. I’d love to see the stats on how much ground he covers. Métanire was also nearly glued to the right sideline. He and Ethan Finlay had a fortunate matchup in the first half, and they abused it with pace and skill right down the wing. United have not always gotten width in the attack this year, but when they do, it most reliably comes from Métanire, the winger ahead of him, and their interplay. I’ve written before about how Minnesota’s success or failure seems to depend on the performances of their fullbacks, and Métanire’s influence in attack and defense was simply critical to achieving a point. 2. Francisco Calvo was lost. The Loons’ left back had a really poor game. He was not directly responsible for either of the first two goals, but had chances to do more and did not. On the third goal, he was completely at fault, seemingly trying to control or block a free kick and instead deflecting it into his own net. Then, late in the match, he had a beautiful opportunity to score, but blasted the shot over the goal. Figuring out how to get the best out of the talented Costa Rican has been a big issue for Minnesota for their entire time in MLS. After struggling in the center back spot, he was moved to his natural left center back role in a back three where he had some success, before moving out to the left back role late last year and to the start of this one. The move certainly makes sense, because Calvo is a risk-taking defender and a talented attacking player. Putting him in a role where the team is less likely to pay for defensive gambles gone awry, and where he can get forward, should help accentuate his strengths and minimize his weaknesses. But as good as Calvo was in the season opener in Vancouver, he’s had a lot of difficulty since. He seems to not be able to find the right opportunities to go forward, and he is not engaged defensively. Unlike his opposite number, Calvo always seems to be either behind the play on attack, or chasing behind the ball on defense. It’s perhaps to be expected given that this is not his natural position, but it’s increasingly becoming a problem for Minnesota. Contrast his passing chart with Métanire’s, and you can see clearly the differences between fullbacks. While on the right, Métanire played with the chalk of the sideline on his heels, Calvo frequently drifted toward the center of the field. His movement is a bit reminiscent of how the right full back (Nick Lima or Tyler Adams) has played in Gregg Berhalter’s USMNT, but he hasn’t committed all the way to being a true midfielder. Instead he’s in a half-space between the two positions and I don’t think it’s suiting him well. The lack of interplay is also clear. See how many of Métanire’s passes are short passes to nearby players. Now see how often Calvo is making long passes. 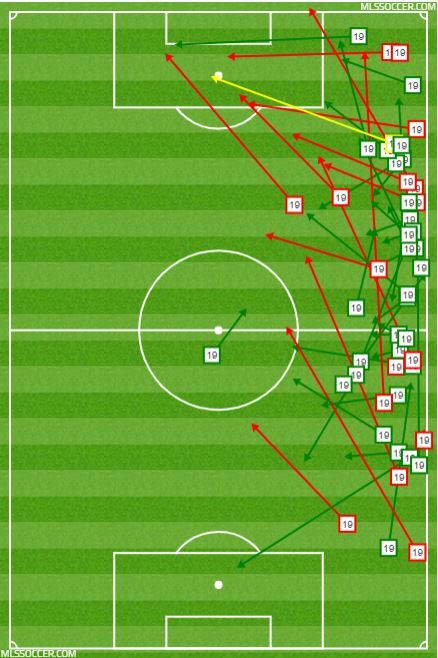 Is this Calvo’s fault, or is he being left on an island by the winger ahead of him and the midfielders in the center? It’s hard for me to tell, and perhaps there’s a bit of both. Regardless of the cause, the left side of the Loons’ attack and defense is a real issue right now, with four different players starting in the left attacking spot over six games, and a struggling left back. The tactical instruction here has to improve for United to improve. 1. Miscellaneous Notes. Hooray for Ozzie Alonso’s opener, I’m so relieved that the Loons scored the first goal… …I thought Ján Greguš had a decent game, and was particularly impressed with his first-time ball to Ethan Finlay which created the second Minnesota goal. While the Slovakian has not had the standout game or two of his fellow offseason signings, and perhaps deserves more pressure with his DP tag, I’ve never really had cause to complain about him either… …Ike Opara’s nasty collision late with New York’s Valentín Castellanos seemed likely to rule him out of next week’s match, and maybe further down the road. It will be interesting to see how the Loons respond. Brent Kallman will surely start. Will Wyatt Omsberg be on the bench, or will the team rely on Eric Miller and Lawrence Olum to provide emergency cover? I’m just assuming Michael Boxall will play, despite breaking his nose… … What was that large asteroid on the podium that the players passed while walking in? That was so confusing, did anyone else notice that? Why is nobody talking about this?